Bedrooms: n/a "Open Plan Studio"
Size: 322 sq. ft. "30 m2 Open Plan studio"
Year Built: 2010 "Has just been furnished!" 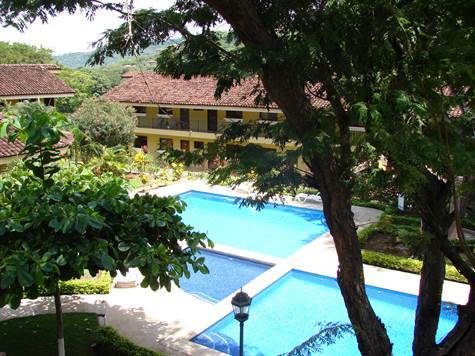 New Project in Ocotal, Playas del Coco, Guanacaste, Costa Rica. Playa Ocotal is a small village that is 3 km south of El Coco on the northern pacific coast of Costa Rica. The beach on Playa Ocotal is one of the best places to snorkel in the area. Playa Ocotal is also one of the cleanest and quietest beaches around. Ocotal project is very close to one of the best in the country, Ocotal Fishing and Scuba Diving Resort. Ocotal is a five-minute drive from Playa del Coco, a small fishing and tourist village where you can find a supermarket, bank, pharmacy, restaurants, stores, bars, and nightlife. Liberia International Airport is just 25 minutes away. Ocotal is considered the best place in Pacific coast for scuba diving (crystal clear water) and fishing is out of this world. @ SWEET DREAMS - (STUDIO) - only one upper floor unit available at this price. 1 BEDROOM, KITCHENETTE, DINING AREA, 1 BATH PARKING SPACE, POOL, RANCHO, SECURITY. 322 SQ.FT OR 30M2. Inclusive of all imported Full furniture and appliances package to make unit ready to move in or rent out worth US$8,500.00, including air-con unit, blinds, ceiling fan and water heater and granite countertops.